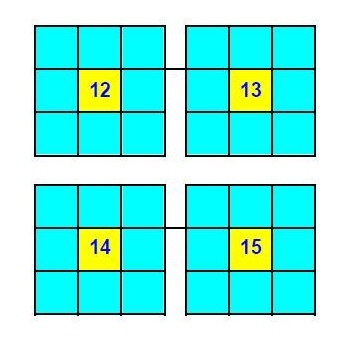 I found this very nice set of number puzzles on the net on the following site – http://www.mathsphere.co.uk. The puzzle looks pretty innocuous, and by sheer brute and force, you can try to solve it, though it is not very easy until you find the method to do it. So here it goes – Look at the figure below. Fill out each of the squares with numbers 1 through 8 (each number exactly once), so that the sum of numbers on each of the side equals to the number in the center. As always, please send me your answers directly at alokgoyal_2001@yahoo.com and if you like the puzzle, please share with others. This entry was posted in Puzzles and tagged Alok Goyal, Magic Square, number puzzles. Bookmark the permalink.